How does a pop duet work out for impulsive and irreverent six-year-old Marina and 75-year-old Marita? Cheeky Marina plays to the camera, ignoring the chiding of her aged grandmother, Marita. Marita’s crumbling house was built by her long-dead husband. She moved in when they married, over 53 years ago, and nothing much has changed since. Now her home is under threat; the neighborhood is being torn down, replaced with charmless apartments. A beautifully constructed documentary that depicts with great subtlety the changing ways in suburban Spain. Adán Aliaga has turned a simple subject into a dashing and fast paced, remarkably candid documentary on family life in Spain, modernization and generational change. A tribute to grandmothers everywhere, filled with painterly images of southeastern Spain and a director’s love for his family. This film qualified for a 2006 Academy Award® nomination. Produced by: JAIBOFILMS, IGNACIO BENEDETI CINEMA, SALTO DE EJE PRODUCCIONES CINEMATOGRÁFICAS. Producers: ELENA VALLEJO, JUANJO GIMÉNEZ, XOSE ZAPATA, ADÁN ALIAGA. 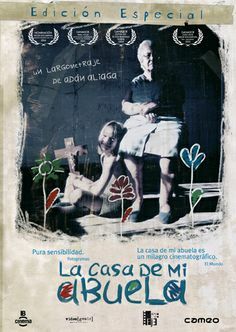 Best Documentary for My Grandmother’s House (2005). • Won, Special Mention for My Grandmother’s House (2005). • Nominated, Punto de Vista Grand Prize for My Grandmother’s House (2005). • Nominated, Jules Verne Award for My Grandmother’s House (2005). • Nominated, Made in Spanish Award for My Grandmother’s House (2005). • Won, Best Documentary for My Grandmother’s House (2005).